adding and adusting brightness and contrast. 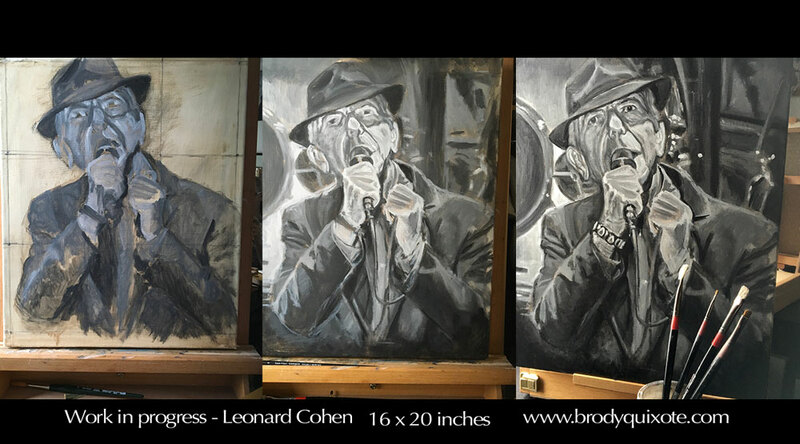 Fine tuning the prints i'm making of my oil painting of Leonard Cohen to make a small print run. I know I get really finicky with them, changing the contrast here, adjusting the brightness there. But, it's all to do justice to the great man himself! I'll pop up a post when I have them uploaded to my wee Etsy shop. Limited Edition print run of 100 of each of the following sizes - A4, A3 and A3+. 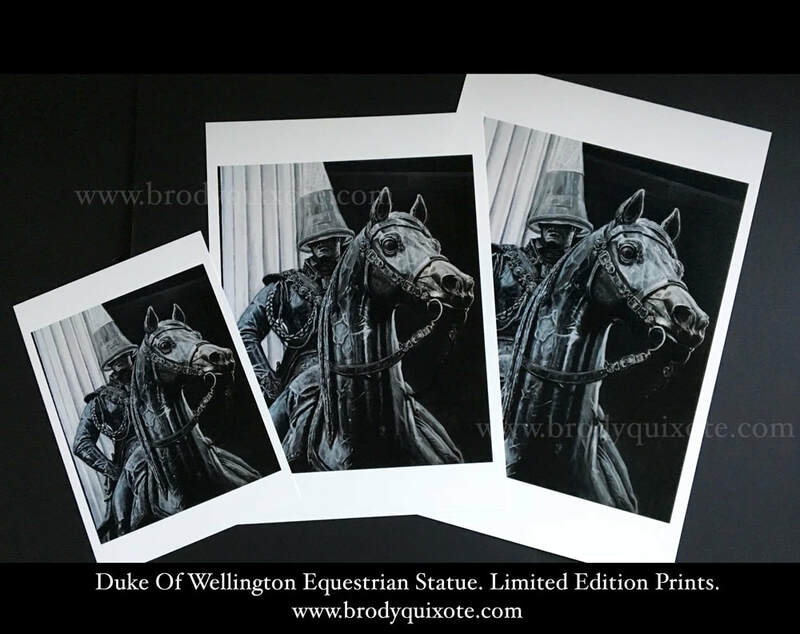 It's a dreich day here, so i'm inside printing off some more of the limited edition run of my Duke of Wellington Equestrian Statue oil painting. I'm doing three sizes, and strictly limited to 100 of each size, on Hahnemuehle Fine Art Baryta Satin paper. The paper is a nice heavy 300 gsm and feels substantial to the touch. I would say it's a warm white, and really suits the subject piece, of the smooth, yet weathered statue. It's a curious thing, but to my eyes the statue, although painted in pure greyscale, from white to black, seems to give off a slight bluish tint. In renaissance art funnily enough they used a mixture of white and black to give the impression of the colour blue - have a peek next time you're in an art gallery and you'll see what I mean. Art historians say that it's because blue as a colour was prohibitively expensive for a lot of artists back then. I leave a white border around the image to help when it comes to having them framed and matted. As the paper is Satin on the front then I sign on the back in pencil, and each print comes with a certificate of authenticity. ​Worldwide standard shipping is free, but if you'd like to upgrade to a tracked and signed package then please choose that at the Etsy checkout. So if you have studied or worked in Glasgow, or if you have ex-pat family living in far off climbs, or, indeed you'd like a print of Glasgow's most loved and known statue, then please click on the Etsy button below, where you can see more close up details of the piece. Have a fantastic and creative weekend. Just finished watching an interview on MSNBC with Omarosa Manigault Newman, who's creating quite the stir in the USA with her taped conversations of various Whitehouse staff. She seems to be one tough cookie, and even Fox news claims that she has outsmarted Trump. He's so triggered by what she may reveal that Vanity Fair has reported that Trump has told advisers that he wants Jeff Sessions to have her arrested. Omarosa's definitely not for backing down - she has a book to sell, and to be fair, she's trolling the Trump administration to the hilt, so much that the Republican National Congress has just released a video attacking her - showing the greatest hits of her 'support' for Trump on the campaign trail. In the meantime the world just looks on aghast...and snacks on its popcorn! Hopefully some normality will return to the states after the midterms when the Democratic party flips the house. The blue wave's coming, as they say. In the meantime here's a couple of t-shirts that i designed, with what i suspect is the man baby Trump's reaction, every time Omarosa appears on his telly screen! The redbubble ones are available worldwide. The Amazon ones i think are only shipping within the USA at the moment. Click the image for redbubble tees. Click image for Amazon tees. Have a great night, and a sweet naptime! I'm getting there slowly and surely with the new Leonard Cohen painting. Still a couple more layers to go though! Hopefully it'll just be another few days until the painting is finished, but you know me..it'll take as long as it takes. For my other works and limited editions please check out my paintings page. Scary Dolls And Teeny Hands! 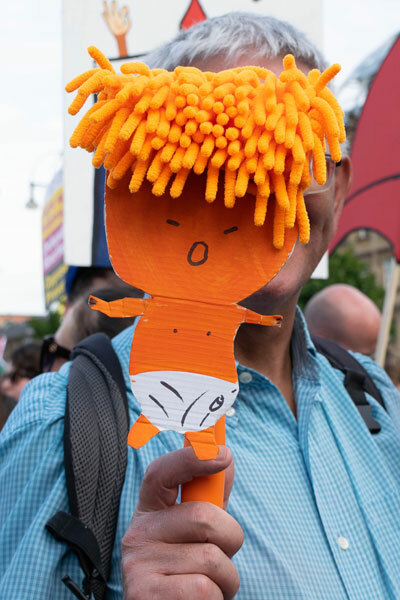 Dashing out to photograph the gay pride in Glasgow today, but here's a few scary wee Donald Trump dolls from yesterdays Anti-Trump protest in Glasgow's George Square. Well it was Friday the 13th after all! Hope they don't give you bad dreams! There's A Trump In My Kitchen...And It's Scaring My Cat! 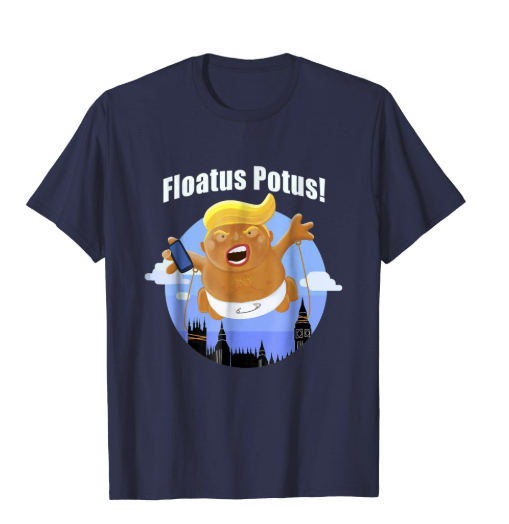 Fair play to Redbubble, they shipped the 'Floatus Potus' tee shirt super speedily. It arrived yesterday, and is even more colourful in real life. Alas, he's been scaring my cat ever since...and I had to turn it to face the wall. I'll be out filming and photographing both the Trump Protest and the Gay Pride March over the weekend, so I hope the rain stays off. 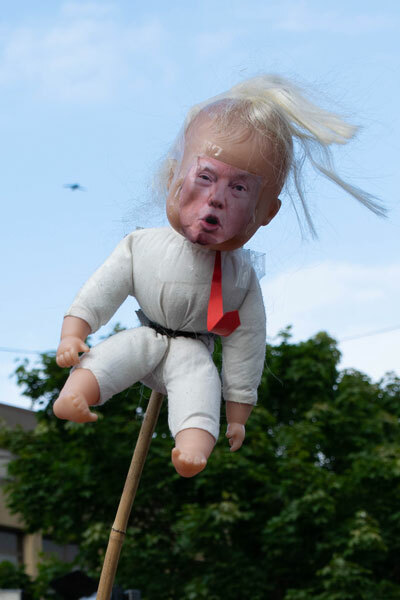 I just heard the trump balloon baby is going to head to Scotland too, exciting times! Remember you can buy one of these sweet 'commemorative' Trump Tees and other designs from both my Redbubble and Amazon sites - click on the images below to get whisked away to them. Redbubble ships worldwide, but alas, Amazon only ships within the US at the moment. For more of my Redbubble tees 'commemorating' Donald Trump's visit, click on the image above. For more of my Amazon tees 'commemorating Donald Trump's visit, click on the image above. ​Have a great day, and catch ye soon! A Giant Balloon...And An Inflatable Blimp! It's been a busy last few days. I was asked to cut a trailer from the footage of my friends musical - 'Melania', by Brooks & King, which was fun. The action takes place in the Whitehouse and focuses on Melania Trump being guided through these dark hours by the former First Ladies, Eleanor Roosevelt, and Jackie Kennedy. The lyrics and music are amazing, and even though I had been to see the musical at the Oran Mor in Glasgow's Westend, and knew how awesome it was, and how much the audience loved it, I relished the chance to have repeated viewings, and every time I cut a scene, I noticed something new in the actresses performances. The three women who portrayed the First Ladies were absolutely first class! No wonder the newspapers etc gave it five star reviews! Someone who is getting less than five star reviews is the actual President Trump, he's heading to the UK and in true Brit fashion there are lots of protests lined up to film and document. 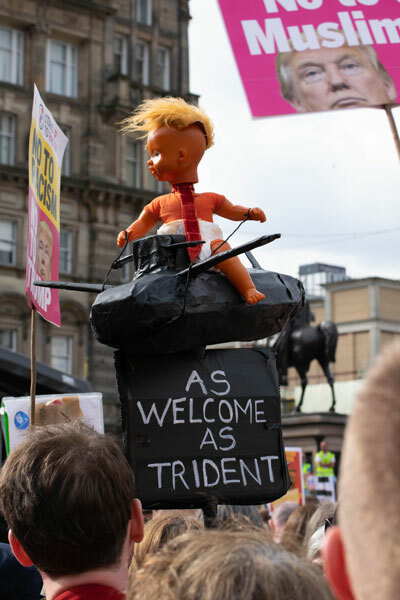 You'll have heard about the giant Trump Baby Blimp that's going to be flying in London - it's that quintessential British humour in action - polite, but pricking the ego of the manbaby it portrays. I'll be wearing my 'Floatus Potus' t-shirt, whilst i'm dashing about recording everything. ​If you're based in the UK (or worldwide), and would like one of these t-shirts for yourself then either click the image above for the redbubble shop, or for USA only, check them out on Amazon by clicking the image below. For more of my Amazon tees 'commemorating' Donald Trump's visit, click on the image above. It'll be a busy weekend as i'll be also documenting the Glasgow Gay Pride March on Saturday too. More on that, later. That part of Edwin Morgan's poem, 'At Central Station', has always stuck in my mind. I think it's the part of me that identifies with looking, searching, and taking everything in - the surroundings, the people, the ambience, the rush...committing it to memory, film or sketch. Maybe it's because I grew up in a rural area, that sometimes I can be overpowered with the 'busyness' of the city. The sights, the sounds, the speed.. To be honest it's probably one of the reasons I like to be behind the lens, whether that be with the film camera, or the dslr - it's that last little shield between me and the 'real'. Holding it outward, protecting myself from being sucked in. I've been documenting aspects of Scottish life for a few years now, usually marches and protests - yep, i know - me that doesn't like crowds. I'm now putting up some photographic galleries as I give the website a little facelift. 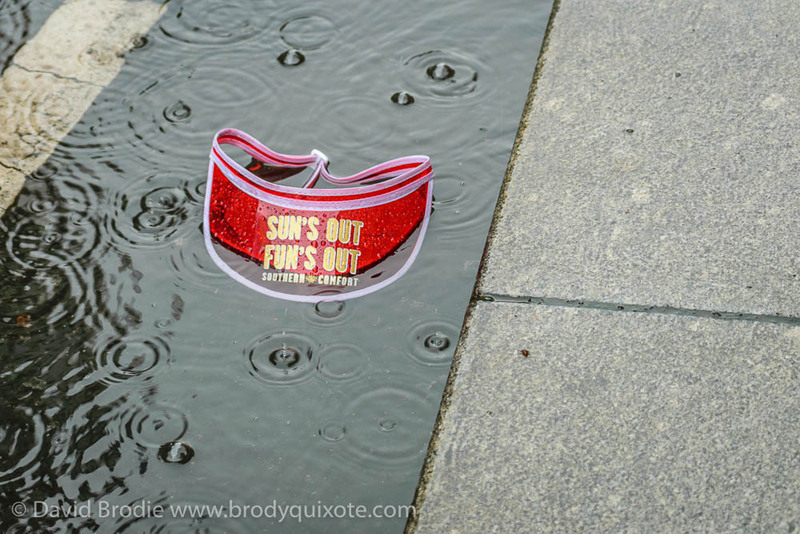 The first one is a few stills from the Gay Pride March in Glasgow in 2016, when the skies opened and the rain poured down. Have a peek here - Photography. Of course to me it looked fine and dandy, and like someone was living there. I chuckled again the other day remembering the comment, as I know my website was looking a bit 'washed in with the tide' itself. A bit more Leonardo's workshop than Rietveld Schroder's 'Utrecht' house (see my MA Hons in Art History hasn't gone totally to waste), but I digress. Anyway, the website is slowly coming together. I've added a page where you can see my recent paintings. The plan is to delve deeper into each piece and explain the inspiration behind them. In the meantime there's a link to my Etsy shop where i'm selling limited edition prints of my paintings, and also open editions of some other pieces. The poor Etsy shop had lain practically empty until January 2018, but at last it's getting a little 'love and attention'. Glad to say I made my first sale on it last week...huzzah! Here's the link, if you'd like to buy some contemporary art from me. I'm about to give the website a little spring clean! Keep an eye out for the 'new look'. See you soon when i've dusted the place.